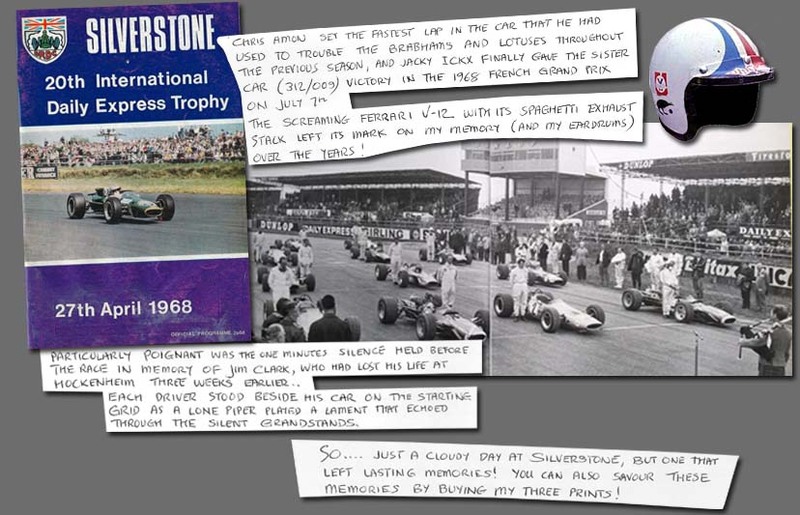 Starting from 5th, Chris Amon harried the winning McLarens and Mike Spence's BRM in the Daily Express Trophy F1 race at Silverstone on 27th April 1968, finally finishing third with the fastest lap. Chris Amon set fastest lap in the car that he had used to trouble the Brabhams and Lotuses throughout the previous season, and Jacky Ickx finally gave the sister car (312/009) victory in the 1968 French Grand Prix on July 7th The screaming Ferrari V-12 with it’s spaghetti exhaust stack left it’s mark on my memory (and my eardrums) over the years! Particularly poignant was the minutes silence held before the race in memory of Jim Clark who had been killed at Hockenheim three weeks earlier. Each driver stood beside his car and a lone piper played a lament that echoed through the silent grandstands. So . . . just a cloudy day at Silverstone, but one that has left lasting memories!! You can also savour these memories by buying my three prints! !